Natives of Mexico and the American Southwest, both Yucca and Agave plants belong to the family of Agavaceae. Their leaves grow in a spiral pattern out from the centre forming a ‘rosette’ structure. One of the differences between the two is that over time Yuccas will grow taller whereas the Agave only gets bigger. This Yucca was growing in the hot dry climate of the Saguaro National Park in Arizona – that’s a Saguaro cactus peeking out of the bottom left. This ancient Agave is in amongst the ruins of a church in Zacatecas, Mexico. Yuccas are less fleshy than Agaves and generally less spiny. The rosette structure of a Yucca as seen from the side. 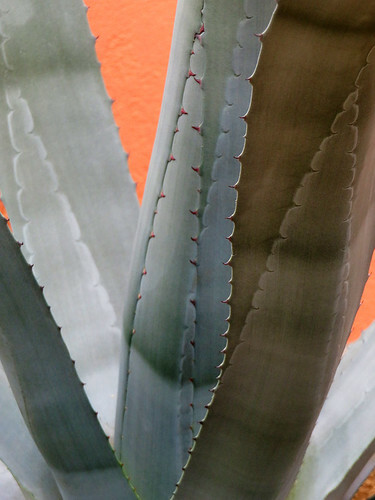 Agaves are fleshy enough that the imprint of each leaf is seen on the others. 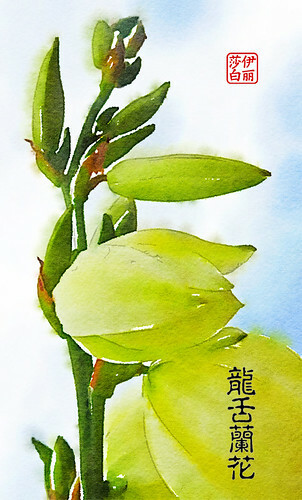 Yuccas survive in colder wetter climates than the Agaves. 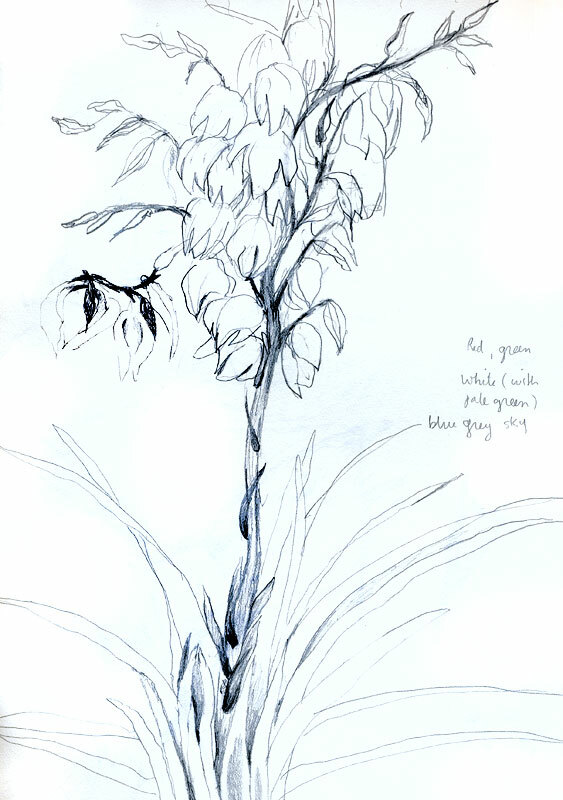 This is a drawing of a Yucca in Vancouver where the winters are relatively mild and considerably wetter than Arizona. 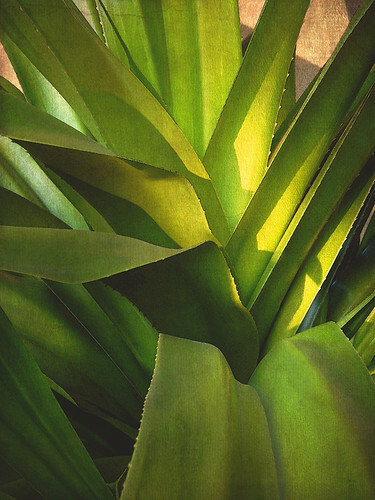 Agaves thrive in their native land, the hot dry climate of the American Southwest and Mexico. This region of the state of Jalisco has fields and fields of Agaves azules, the source of agave nectar that will be distilled into tequila. 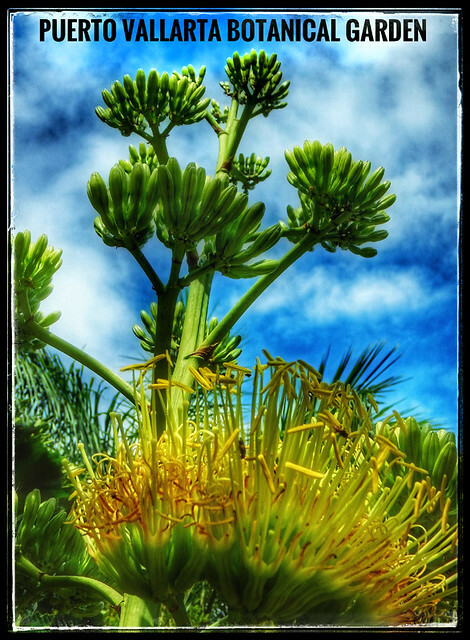 Yuccas typically bloom every year with bell-shaped blossoms while many Agaves bloom only once and then die, and the flower has a very different shape. The Yucca ‘group’ features about 40 species, whereas the Agaves number around 300 species. More of the Daily Post’s Weekly Photo Challenge: Variations on a Theme. More of Nancy Merrill’s Photo a Week Challenge: Structure in Nature. With her photo challenge: Structure in Nature, Nancy started me writing a post on the rosette structure in plants. While putting together the post I realized that I had mislabelled many of my photos and ended up googling a lot of different plants to determine the differences. I didn’t manage to finish all of them but this is one of many! These are so cool! I love looking closer at leaves and plants. You find the most amazing things. Thanks for joining the challenge! You got me started looking at ‘structure in nature’; but when I looked up some of my photos on google I found I had mislabeled a bunch of them. Next I have to do the difference between Yucca and New Zealand Flax, and then there’s dracaenas, aloes, and more!